Democracy for New York City (DFNYC) applauds Governor Cuomo for approving a ban on hydrofracking in New York State. It has been clear for some time that this method of natural gas extraction poses significant health and environmental risks and should be banned. DFNYC is proud to have been a member of the New Yorkers Against Fracking (NYAF) coalition, and we will continue to speak out on what is one of the great environmental issues of our time. Today's decision is a historic moment for our state and we applaud the leaders of NYAF, Sane Energy, United for Action and other groups who worked so hard to make this happen. We at Democracy for New York City (DFNYC) are shocked and appalled by the decision of the grand jury in Staten Island to not indict the police offer who choked out Eric Garner. This incident was captured on video and witnessed by many people. Eric Garner's wife and children were entitled to see the police officer in this case answer for his actions in a fair trial. This is another case where racial and class biases have hindered, if not prevented, a chance for citizens to have justice under the law. We call for this matter to be taken up in federal court. DFNYC will continue to work with progressive groups and community leaders in our city to ensure that the day will come when people, regardless of race or class, can live their lives without fear. We call on the Mayor, City Council, Police Commissioner and our elected representatives to enact much needed reforms. 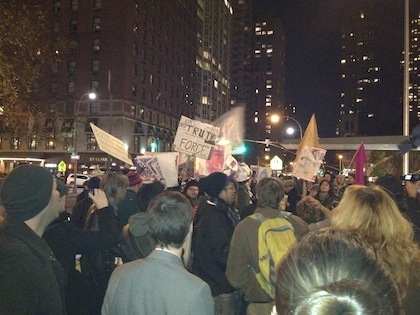 The 2014 elections are around the corner and NYC progressives are organizing events. Sign up to volunteer today - we need you! 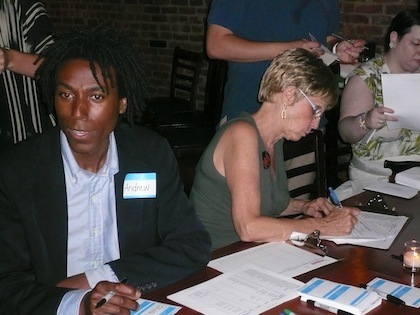 Monday night, Oct. 27: Letter writing to save the U.S. Senate. Write letters to progressives in Iowa and N.C. (we've got lists!) encouraging them to volunteer for Kay Hagan and Bruce Braley - two great Dems in two close races for U.S. Senate. 6:30-8:30 at Whole Foods at 95 East Houston. Details here. Percentages will be posted here later today. Thank you to our vote counters! DFNYC members who had attended 2 events from Nov. 17th, 2011 to Tuesday, August 12, were eligible to vote. DFNYC is committed to the principle of the secret ballot. After getting feedback from our members in 2012, we moved to an online system, and we preserve anonymity by having trusted DFA activists from outside New York count the ballots. (This year, one vote counter was a DFA activist while the other was not affiliate with DFA.) No one in DFNYC knows who anyone voted for. 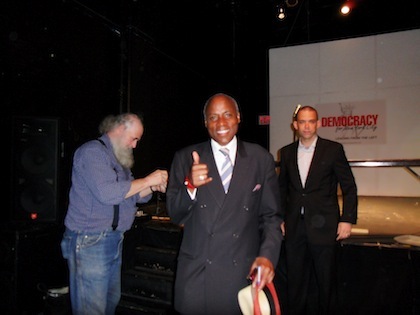 Democracy for NYC is a local coalition group of Democracy for America. 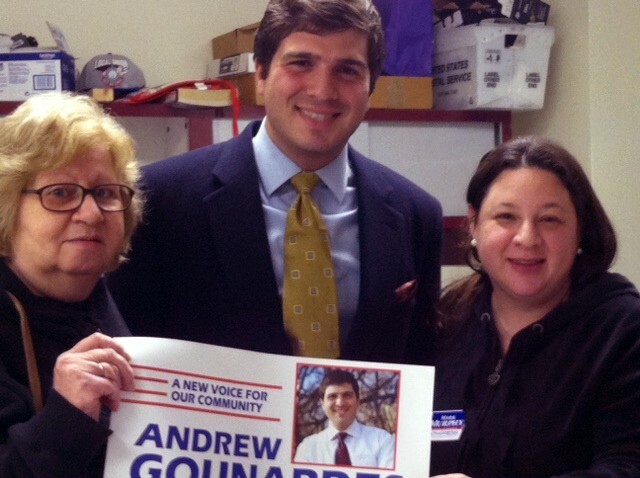 We get involved in progressive issues and campaigns in New York and across the country. Join us for the 2014 midterm elections! To learn more, read What We Stand For. Voting is now open for Democracy for NYC's endorsements in 2014 races in New York City, and we've extended the deadline one week to the Tuesday after Labor Day at 10pm, as some candidates in key races have recently submitted questionnaire responses. If you have attended at least two DFNYC events from Nov. 17th, 2011 to last Tuesday, August 12, you are eligible to vote. If you are not sure, please vote, as we will sort out eligibility later. DFNYC is committed to the principle of the secret ballot. After getting feedback from our members in 2012, we moved to an online system, and we preserve anonymity by having trusted DFA activists from outside New York count the ballots. No one in DFNYC will know who you voted for. More on Rules & Procedure: Click here.